Based on a research project funded by the Army Research Institute, Foreign Language Learning reports original empirical and theoretical research on foreign language acquisition and makes recommendations about applications to foreign language instruction. The ultimate goal of this project was to identify a set of psychological principles that can provide the foundation for--or at least, argumentation for--a foreign language training course. This book reviews the various studies of which the project is comprised. It begins with an overview chapter outlining the scope of the project and summarizing some of the experiments that were conducted in the laboratory. 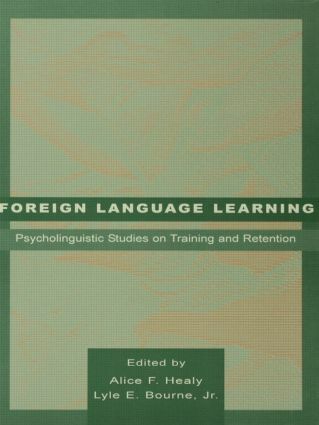 In each of the following chapters, the contributors report on previously unpublished research on selected specific psycholinguistic training principles; vocabulary and concept acquisition; language comprehension; reading processes; and bilingualism. The final chapter--prepared by a prominent expert on second language training--provides an overview and evaluation of the contribution of the research described in earlier chapters to the goal of improving instructional methods in foreign language learning. * Bilingualism, which addresses Stroop interference effects in bilinguals between similar and dissimilar languages, the individual differences in second language proficiency, and the hierarchical model of bilingual representation. "A strength of the book is that each chapter attempts, in greater or lesser degree, to relate the findings of the study to second language teaching, enhancing the potential relevance of the work….Overall, the text is readable and clear." Contents: A.F. Healy, L.E. Bourne, Jr., Preface. Part I:Introductory Overview. A.F. Healy, I. Barshi, R.J. Crutcher, L. Tao, T.C. Rickard, W.R. Marmie, V.I. Schneider, A. Feldman, C.J. Buck-Gengler, S.G. Romero, N.B. Sherrod, J. Parker, L.E. Bourne, Jr., Toward the Improvement of Training in Foreign Languages. Part II:Vocabulary and Concept Acquisition. A. Feldman, A.F. Healy, Effect of First Language Phonological Configuration on Lexical Acquisition in a Second Language. V.I. Schneider, A.F. Healy, L.E. Bourne, Jr., Contextual Interference Effects in Foreign Language Vocabulary Acquisition and Retention. R.J. Crutcher, The Role of Prior Knowledge in Mediating Foreign Vocabulary Acquisition and Retention: A Process Analytic Approach. M. Serwatka, A.F. Healy, On the Status of the Count-Mass Distinction in a Mental Grammar. S.E. Gathercole, A.S.C. Thorn, Phonological Short-Term Memory and Foreign Language Learning. Part III:Language Comprehension. I. Barshi, A.F. Healy, Misunderstandings in Voice Communication: Effects of Fluency in a Second Language. L. Tao, A.F. Healy, Anaphora in Language Processing: Transfer of Cognitive Strategies by Native Chinese, Dutch, English, and Japanese Speakers. I. Barshi, D. Payne, Argument Structure and Maasai Possessive Interpretation: Implications for Language Learning. M.F. St. John, M.A. Gernsbacher, Learning and Losing Syntax: Practice Makes Perfect and Frequency Builds Fortitude. Part IV:Reading Processes. J. Moravcsik, A.F Healy, Highlighting Important Words Leads to Poorer Comprehension. C.J. Buck-Gengler, S.G. Romero, A.F. Healy, L.E. Bourne, Jr., The Effect of Alphabet and Fluency on Unitization Processes in Reading. A.T. Gesi Blanchard, Transfer Effects of First Language Proficiency on Second Language Reading. Part V:Bilingualism. M. Brauer, Stroop Interference in Bilinguals: The Role of Similarity Between the Two Languages. A. Miyake, N.P. Friedman, Individual Differences in Second Language Proficiency: Working Memory as "Language Aptitude." J.F. Kroll, E. Michael, A. Sankaranarayanan, A Model of Bilingual Representation and Its Implications for Second Language Acquisition. Part VI:Commentary. B. McLaughlin, Second-Language Learning Revisited: The Psycholinguistic Perspective.